Here's a wonderful book you might like to read. 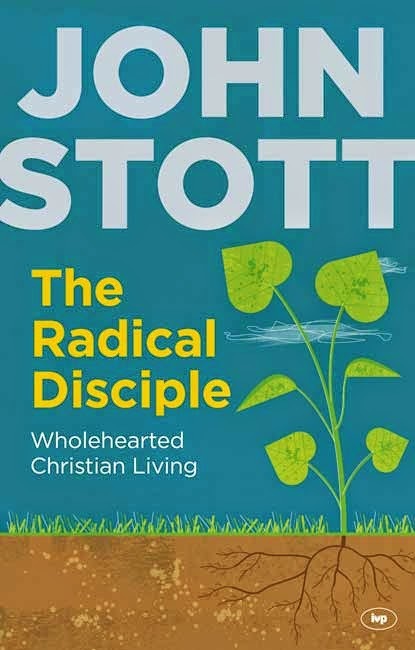 The Radical Disciple is the last book written by John Stott. At the end of this book he put down his pen and finished his writing ministry. As such it has a similar feel to Paul's second letter to Timothy - full of wonderful and pastoral words but with the tenderness that comes with a final letter. It's a slightly random list but Stott himself says that this list isn't exhaustive. The style shifts and changes from chapter to chapter - at times it reads like a short essay (don't be scared by the word "essay" though because it is very accessible writing) while at other times there are personal anecdotes, specially selected quotes from old favourites and extracts from sermons and talks. In lots of ways it reads like a personal journal - and you get a real sense of what it must have been like to sit with him in his study and talk together about all the good stuff. This book is a pure delight to read, filled with the words of a mature, wise, well thought through saint - instructive, pastoral and full of encouragement to strive for godliness without engendering guilt. The Radical Disciple would be a great birthday present book (I know this to be true because I received a copy of it for my birthday from a dear friend), a valuable volume for a church library and a fascinating read for a book club with so many great and relevant issues up for discussion. John Stott has left us with an amazing and beautiful gift in this book. We always have a choice, all of us. As she sank to her knees on the grass and sobbed, the memory of a conversation with Frank floated into her awareness. "But how? How can you just get over these things, darling?" she had asked him. "You've had so much strife but you're always happy. How do you do it?" "I choose to," he said. "I can leave myself to rot in the past, spend my time hating people for what happened, like my father did, or I can forgive and forget." He smiled that Frank smile. "Oh, but my treasure, it is so much less exhausting. You only have to forgive once. To resent, you have to do it all day, every day. You have to keep remembering all the bad things...No," his voice became sober, "we always have a choice. All of us." From The Light Between Oceans by M.L. Stedman, chapter 35.